Welcome to my first ever book review! I don't often embroider but Big Embroidery by Nancy Nicholson is all about plus-size crewel embroidery, using thicker yarns to embellish clothing and home accessories, so I couldn't resist! I have a lot of dk and chunky yarn in my stash so I figured this is a great way to use some up. 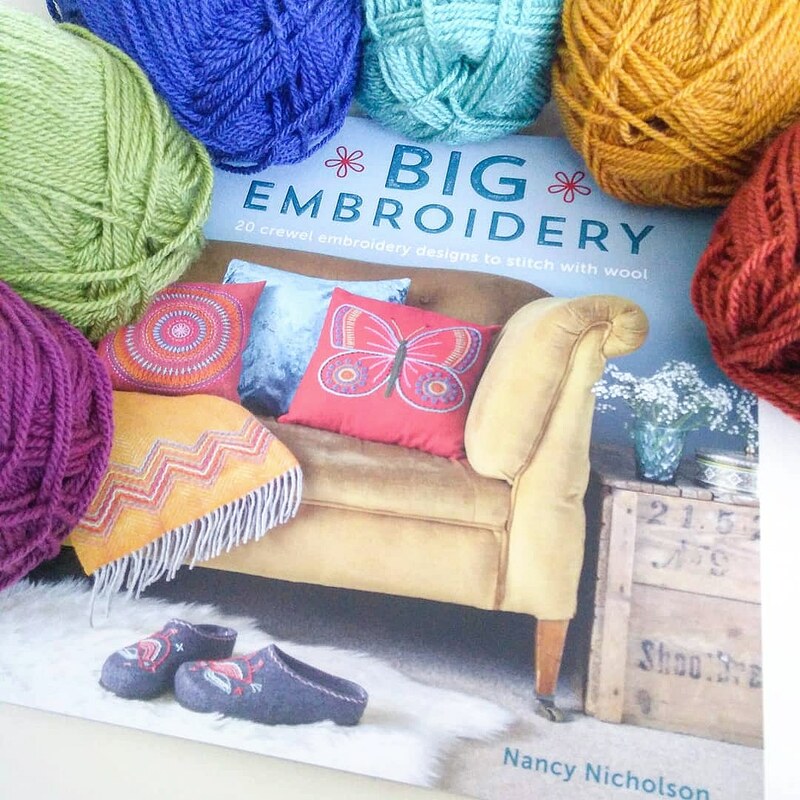 I've read the book from cover-to-cover and I've even tried out one of the projects to help you decide whether you'd like to add Big Embroidery to your bookshelf. If that wasn't enough, there's giveaway at the end of the review where you can win a copy of Big Embroidery by Nancy Nicholson, a Stylecraft Special DK Yarn Pack, and a flower retractable tape measure made by me! When the book first arrived and I had a flick through I was impressed; it's bound in a gorgeous matte cover so it feels good to hold and inside you'll find a colour and stitch extravaganza! The photos are well styled and professionally photographed and the rich, warm palettes are offset by fresh blues creating a comfy but chic feel to the aesthetic. Don't believe me? 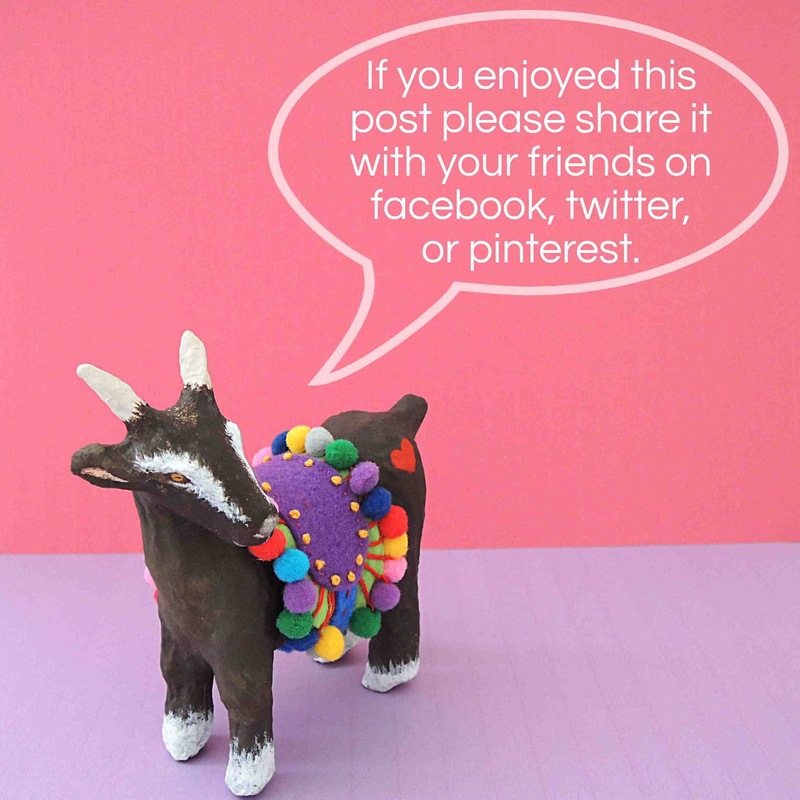 Watch this fab flick through filmed by Sarah Ashford to see what you think. It was really hard to choose just one project but after much looking and assessing of my wardrobe and fabric stash, I decided to embroider a splash of colour onto my dull grey jeans and give them a new lease of life. I've never embroidered onto clothing before and I was a bit worried... I consoled myself with the thought that I've had these jeans for about 7yrs and I was considering ousting them, so it wouldn't be the end of the world if it all went wrong. I rummaged in my yarn stash and came up with six colours to use and, keen researcher I am, I read a bit about how to get going before I started stabbing. There are chapters on tools and materials, a stitch library, the projects, and techniques. 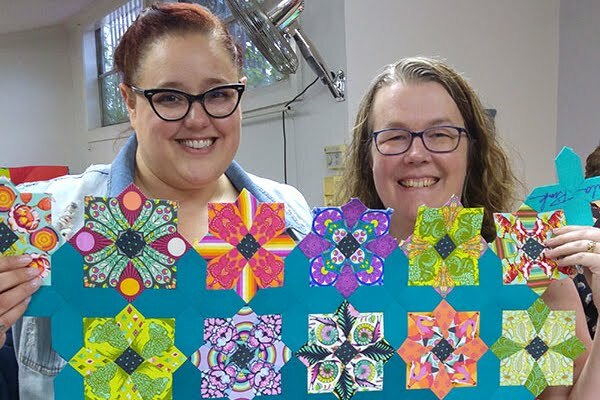 The techniques section talks us through things like adapting the size of paper templates, marking a circular shape, and mounting embroidery designs. All really helpful if you're not very experienced. Nancy sees Big Embroidery as a 'book of ideas' and wants it to be used as an inspirational leaping block, a tool to help its readers push the boundaries of traditional crewel embroidery into the modern world of design. Nancy encourages us to view the projects as samplers, a way to experiment, learn new stitches and, most importantly, have fun! Armed with a size 22 chenille needle, colourful yarn and my jeans, I set about doing exactly that. Nancy encourages us to choose our own stitches but for my first time I've stayed true to the instructions... though going freestyle would be very enjoyable! Even on this small project I learned loads of new stitches. The stitch library includes lovely, clear diagrams and I used it to learn how to sew a Double Laced Running Stitch, an Eskimo Stitch (my favourite), a Herringbone Stitch, a Laced Chain Stitch and a Whipped Running Stitch. The diagrams worked well for every single one. Despite sewing loads of tapestry style projects, I've never embroidered with yarn before and I found it quite different to stranded cotton as it's much more springy! My chain stitches got off to a shaky start but became more even as I went on. One of the things I most liked about the book is Nancy's attitude. 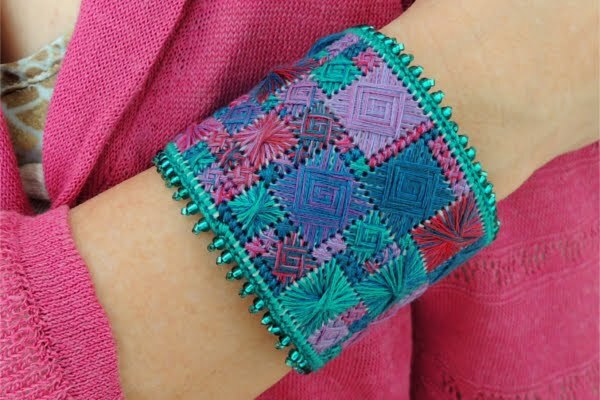 She suggests embroidering anything you can pass a needle through and altering the patterns as you sew, selecting the stitches and colours you most want to use, and I found this free-spirited and playful approach a breath of fresh air that enabled me to feel more relaxed and enjoy it for the process. It's also very accessible. Suggested materials range from the best yarn suppliers to using up scraps and even hunting around second-hand shops for bargain bits of yarn! I love second-hand shopping so this is right up my street. I used Stylecraft Special DK in Sage, Lobelia, Plum, Copper, Gold and Meadow. I figured this was a great fibre to use because it's machine washable and comes in a huge range of colours. Big Embroidery also introduced me to the magic of Pilot Frixion pens. A roller ball that magically disappears with heat and it's brilliant! You can draw on whatever you like, safe in the knowledge that it'll disappear with the wave of an iron...or as Aurelia of Eglantine Stitchery recommended, a hairdryer! I used an iron but I squished my stitches a bit so next time I'll definitely use the hairdryer, thanks for the top tip Aurelia! I completed this project in a few sittings and I'm so happy with the results. Although we're in winter, I've modeled my jeans with some summery sandals because I love this glam, boho look! But, they'd look great teamed with winter boots, springtime flats or even padding bare foot along summery sandy shores...can you tell I miss the warmer weather already? Like Nancy, I stitched the ankles of my jeans and one back pocket. I wanted to be true to the book to check it all worked as it should but I'm looking forward to being more creative and putting my own stamp on the next project I do...because, that's right! There will be a next project. I enjoyed making these so much I don't want to stop here. And you don't have to either! You can win a copy of this inspirational book, a yarn pack including six 100g balls of Stylecraft Special DK in Sage, Lobelia, Plum, Copper, Gold and Meadow and one of my handmade retractable tape measures! Head over to Instagram to enter the competition before it ends on December 14th. I hope you've enjoyed my first book review as much as I've enjoyed compiling it and sharing it with you. If you've got a copy of Big Embroidery or this has inspired you to embroider your wardrobe I'd love to see what you make! Say hello via email or tag me on Instagram using @bobbinandfred and #bobbinandfred.